FAST CARS - RACING –“THE THRILL” !! leading me to a continued ‘fascination’, to this day - - -! 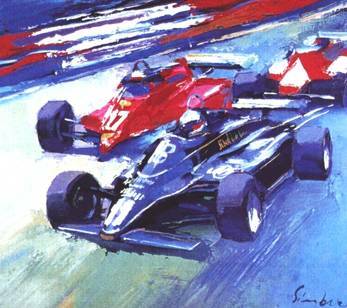 Formula One Racing . . . ! of the engines . . . ! How this small Collection of unique SIMBARIs came about, is typical of Nicola’s love of Life and all that goes on, around him - - F.1 backer and enthusiast, Mansour Ojjeh, came to Nicola’s “The Crazy Horse Saloon” exhibition, in Paris . . . he and Nicola talked “Cars” . . . the rest is history . . . a Challenge! . . . there are only 12 of these special and exciting works. . . Racing Cars”! . . . When an enthusiastic SIMBARI heard Mansour Ojjeh’s tantalizing words, echoing in his ears, the ‘racing car driver’ in him went mad!!! 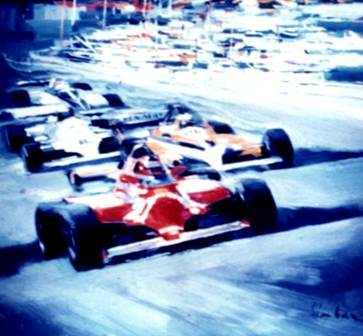 - - - Nicola changed all his “plans” for the duration of the F.1 Racing Season and followed the F.1 Races around Europe . . .! His excitement was wonderful to see !!! I can HEAR the sound of the engines . . .
‘Joining in’ with the Spectacle of the Sport!! the Sun is out . .
winner . . .! ! ?
. 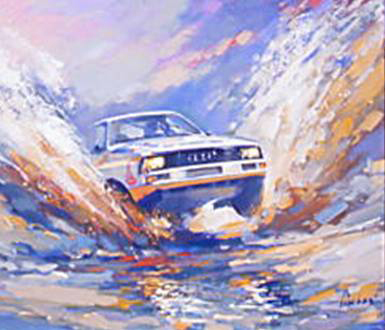 . . these extra-ordinary paintings ‘led to’ another small and amazing group of Car paintings . . . 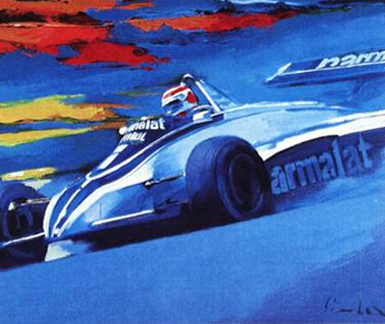 Commissioned by AUDI in 1983/84. 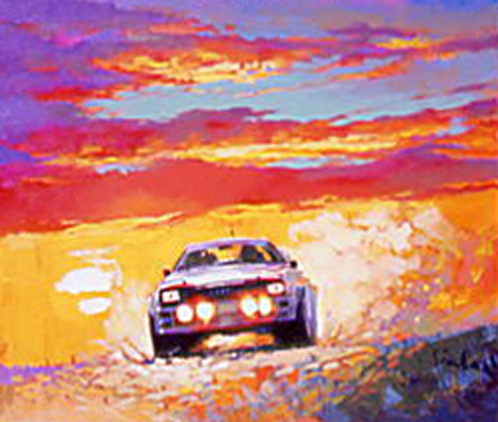 . .
Rallye driver . . .
And once again . . .Monte Carlo ! A different aspect from the F.1 . . . !!! - - - how superb is this view ! - - - blues and golds! Aaah ! WHAT DRAMA ! Nicola told me that this is the North Pole ! Can I believe him? DAZZLING -- DRAMATIC -- MAGNIFICENT – WONDERFUL !! SIMBARI has “taught” me a “Man’s Eye-view” of LIFE . . .
CARS, HORSES, and BEAUTIFUL WOMEN. 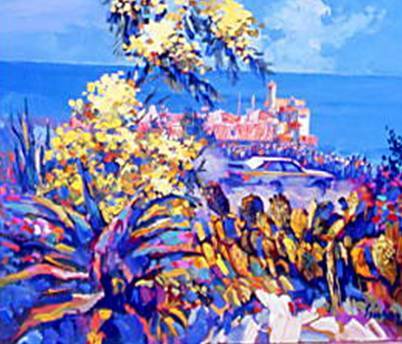 - - his SIMBARI Blues are what I love most about his view of ‘his beloved’ Mediterranean - - - and the Caribbean, Mexico and Florida . .
HIS Zest for Life !! a LIFE that has never been “dull” !!!!! I wonder how YOU will enjoy this “sportsman’s” love of Life ??? Where are these fabulous works NOW ? brought all the incredible paintings back to LIFE . . . and . . .
the thrill of the RACE !! - - - Do you know ? They are an important part of his ‘life’ as an Artist and a Man . . . Regards Elfrida . . .